Treatment options for spinal stenosis range from conservative to the more aggressive and often depend on the severity of the symptoms. Non-surgical treatments for the condition may include: physical therapy, back exercise or pain management with medication. Physical therapists often direct patients to engage in back exercises developed to alleviate these symptoms. These back exercises commonly include a combination of specific stretching and strengthening routines. Forward bending exercises increase the size of the compressed passageways providing temporary relief from pain and strengthening the surrounding muscles to improve stability. It is important to remember that, although these conservative remedies may be helpful in alleviating some spinal stenosis symptoms, they fail to address the underlying pathology driving the symptoms and are not curative. In the event that the symptoms have reached a level where the condition is debilitating and non-surgical treatments have failed to alleviate pain, surgery for spinal stenosis treatment may be required for long term relief. Since spinal stenosis is at its core a condition that compresses the spinal canal, any surgery for spinal stenosis would have to relieve that compression in order to alleviate the symptoms associated with it. The primary goal of any decompression surgery of the spine is to provide additional space for the constricted spinal cord or nerve roots to pass through. Once this space has been opened up, the pain, inflammation, and numbness associated with spinal stenosis should subside. A successful decompression surgery for spinal stenosis will also return any lost mobility or motor skills associated with the condition. When spine surgery is concerned, bear in mind that traditional open back surgeries are highly invasive, and involve longer hospital stays and recovery time due to massive tissue and muscle damage. In contrast, the advanced Bonati Spine procedures are performed on an outpatient basis under local anesthesia with patented instruments which result in same-day pain relief. Treatment options for cervical spinal stenosis are similar in many respects to general spinal stenosis. Doctors often pursue conservative treatments such as stretching, exercises to strengthen the neck and back or pain management with medication in an attempt to manage symptoms short of a surgical option. However, in some patients the pressure on the spinal cord creates symptoms far too painful and debilitating to lead a productive life. In these cases a surgical procedure is necessary to correct the underlying pathology and relieve the patient from pain. 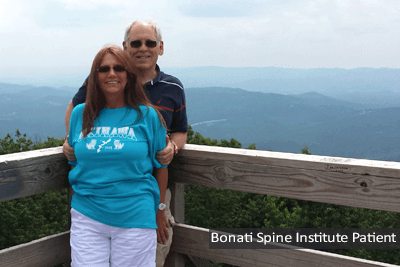 The Bonati Spine Institute has a 30+ year record of developing and performing groundbreaking procedures to treat cervical spinal stenosis and relieve chronic neck pain and other symptoms associated with the condition. The Bonati procedures are performed in an outpatient setting using a mild sedative and demonstrate a minimally invasive approach to treating neck stenosis. All procedures are endoscopic laser spine surgeries performed with patented instruments designed to minimize tissue damage, blood loss, and recovery time when compared to traditional open spine surgery. Cervical spine surgeries performed at the Bonati Spine Institute to treat chronic neck pain are similar to those described for spinal stenosis. The decompression surgeries performed include the decompressive laminectomy, foraminotomy, and laminotomy.